In addition to our regular menu, we feature a Sandwich of the Month at the Deli. We thought you might enjoy a look back at all 12 from 2016. We’ll be unveiling our first Sandwich of the Month for 2017 on January 1, so keep a lookout! 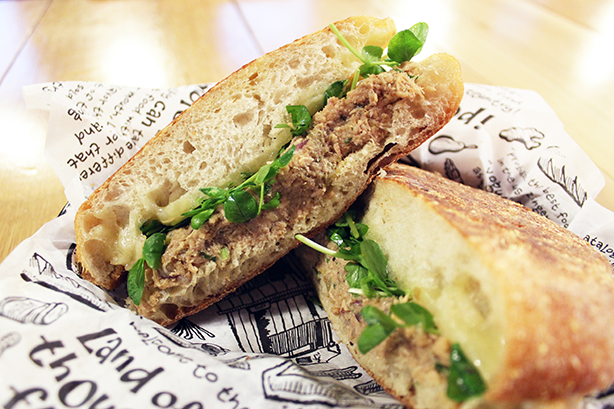 We started the year off with the Balsamic Tuna Melt in honor of our annual Balsamic Blowout.The real star of this tuna melt was our house balsamic vinaigrette made with six-year aged balsamic vinegar from La Vecchia Dispensa. To make a real splash, we combined with Oregon line-caught Albacore tuna, farmhouse cheddar and fresh pea shoots on a paesano roll. Talk about a good catch! CC’s Cordon Bleu was our crazy take on the classic Cordon Bleu. We took it beyond traditional flavors with cornflake encrusted fried chicken and pepper-coated ham by adding in spicy dijon mustard and (since we’re midwesterners) a little ranch dressing. We put our best fromage forward with a softened swiss cheese. All of this was served between two slices of grilled onion rye bread from Zingerman’s Bakehouse. 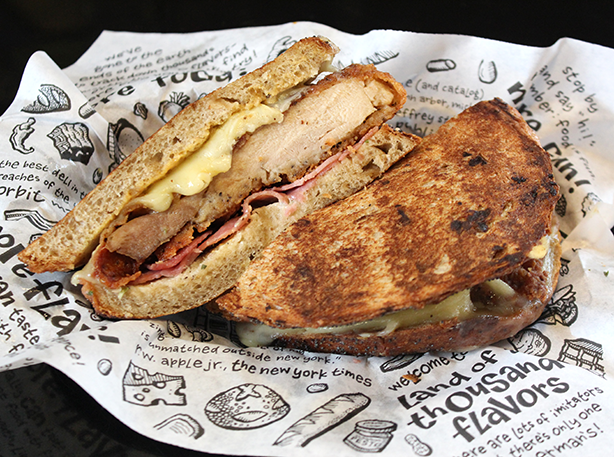 Mr. Rose’s Hamonious Woodland was an aromatic, rosemary-crusted ham paired with tangy, nutty cheddar cheese. We went all out with classic fixings, like leaf lettuce, tomato slices, red onion, mayo, oil and vinegar and served it on warm, grilled sesame semolina. We’re soy pumped about The Brinery’s fantastic fermentation creations that we created NY’s Tempyay for April! 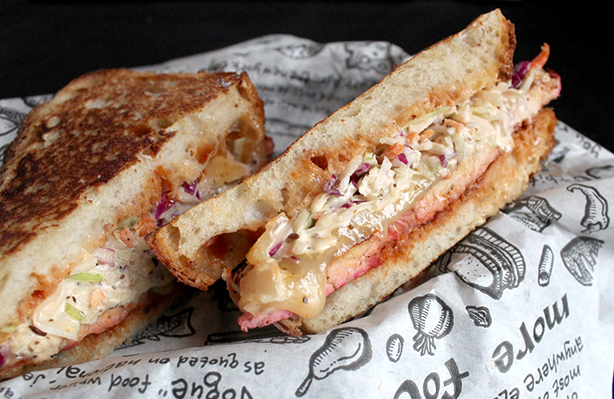 Marinated tempeh was sliced, grilled, and stacked between our house-made bbq sauce, melty cheddar cheese and coleslaw. We served it on grilled sourdough. 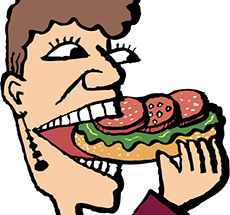 Jeri Dreams of Deli was inspired by Sandwich Line advanced meat slicer pioneer Mike’s deep love of pastrami sandwiches. He designed this flavor combination and named it in honor of his co-worker, fellow Meat Deputy, Jeremiah. 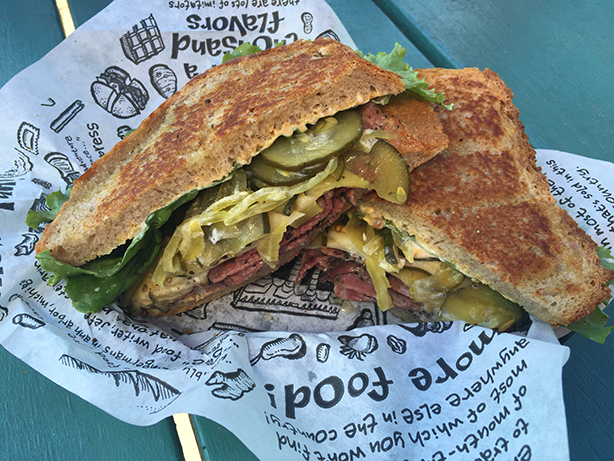 The pastrami and swiss provided a deep, robust base of flavor while Marcia’s Munchies’ spicy pickles lent some punch, combined with a bit of fresh crunch from the lettuce. It was surrounded with a creamy combo of dijon mustard and mayo. On grilled rye, it was what sandwich dreams are made of. Hotsteppin’ out of retirement for one month only, Stan’s Canadian Hotfoot featured Wagshal’s Montréal-style smoked meat brisket. It’s what some have coined “Jewish Bacon”—the beef is whole, prime briskets, smoked for so long that it becomes tender and juicy, nearly melting into the bread. We paired it with our hot hot hot mustard, roasted New Mexico green chilies, and swiss cheese. We served it on our warm, double-baked rye bread from Zingerman’s Bakehouse. 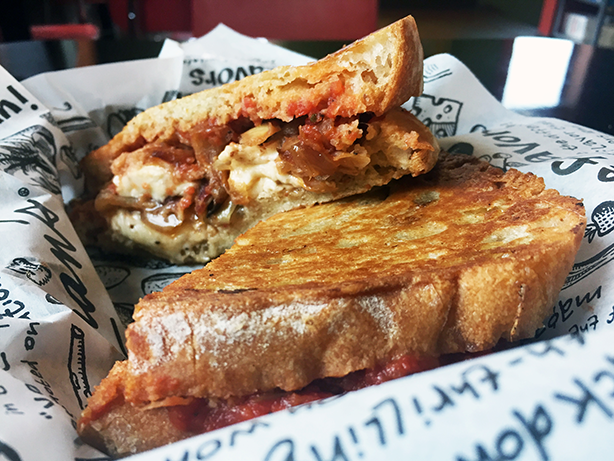 Grandpa K’s Fowl-Mouthed Ranch Hand was a first-rate quartet of bright, summertime flavors favored by the most colorful, hard-working sandwich cooks! 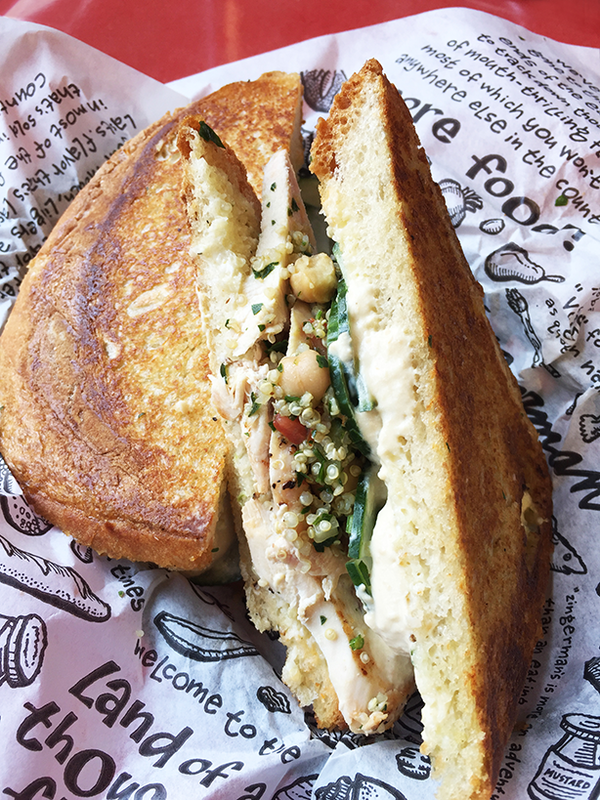 Grilled chicken breast was combined with house-made ranch dressing, garlicky hummus, cucumber and exemplar chickpea-based tabbouleh salad made from scratch, all on rustic Italian bread. 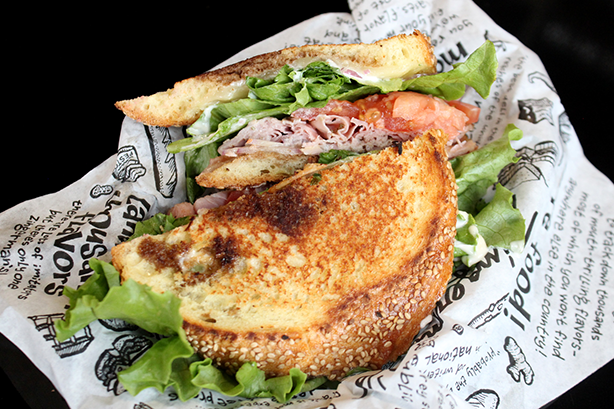 The Morgamatron transformed the hum-drum ham and cheese pairing of days gone by into a bold, yet refreshing, sandwich experience. 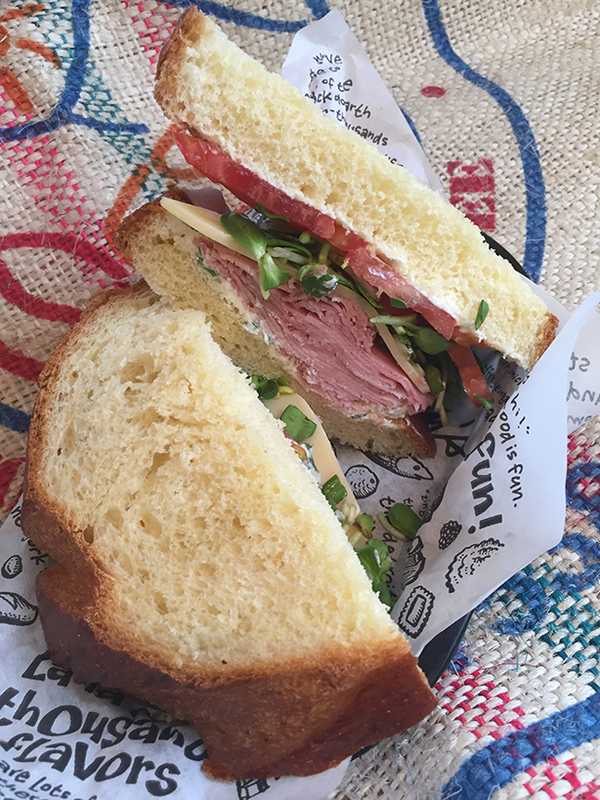 Swiss and scallion cream cheese enveloped rosemary ham, tomatoes and the crunchy sweet duo of sunflower sprouts on ultra-soft challah bread. September’s Sandwich of the Month was the greatest, tastiest, most intense, most confident turkey sandwich ever. 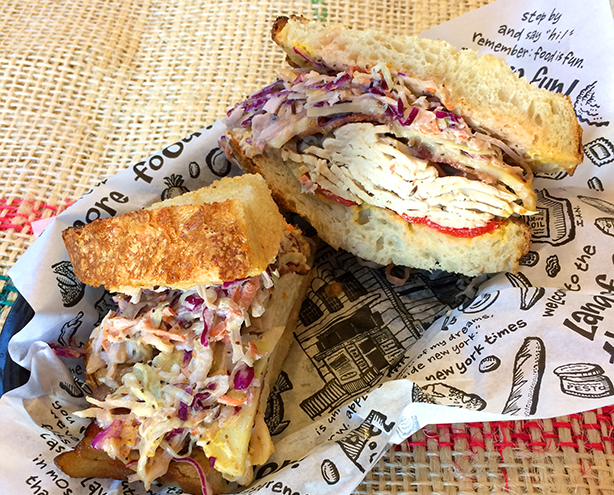 The Super Z was a sandwich of illogical extremes, but undeniably awesome, like its namesake: roasted turkey breast, applewood-smoked bacon, Vermont cheddar, coleslaw, hot mustard and roasted piquillo peppers on toasted sourdough. Designed out of a fondness for satisfyingly simple sandwiches, John’s Big Kid PBJ raised the bar on a classic pairing through really great ingredients…and the fact that it’s grilled in butter! 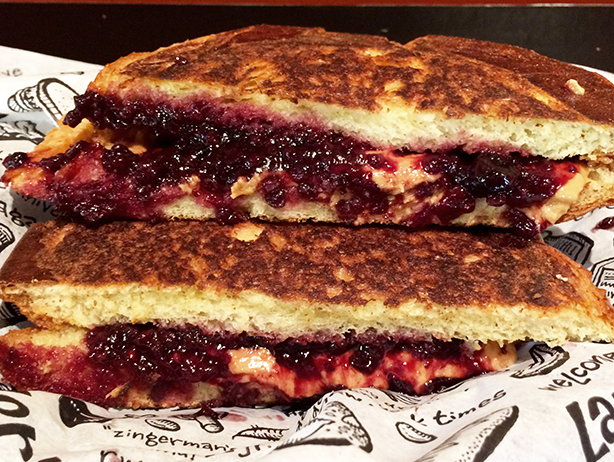 Koeze Cream Nut Natural Peanut Butter and Esch Road Foods mixed berry preserves are layered atop grilled challah to create the epitome of extravagance! 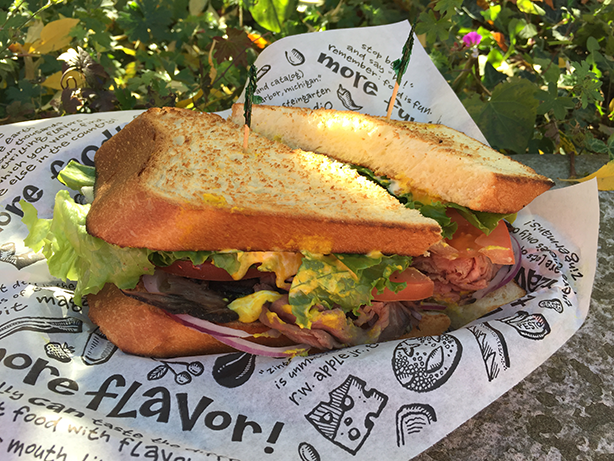 Mikey B’s Big White House featured garlicky roast beef paired with provolone cheese—the two teamed up with a whole slew of classic ingredients we crave: leaf lettuce, tomato, red onion, regular mustard and mayo on toasted Bakehouse white bread. Simple, fantastic ingredients, piled high to satisfy! Mr. White’s Lavish Pizza Sandwich was a strata of deliciousness. 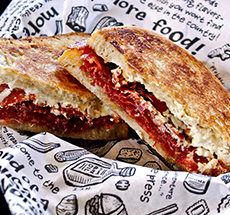 Bacon, mozzarella, tomato sauce and oven roasted balsamic onions on grilled rustic Italian bread. A true masterpiece of ooey-gooey proportions! We ended the year with a seriously flavorful bang. Here’s to a new year of fantastic sandwiches!! 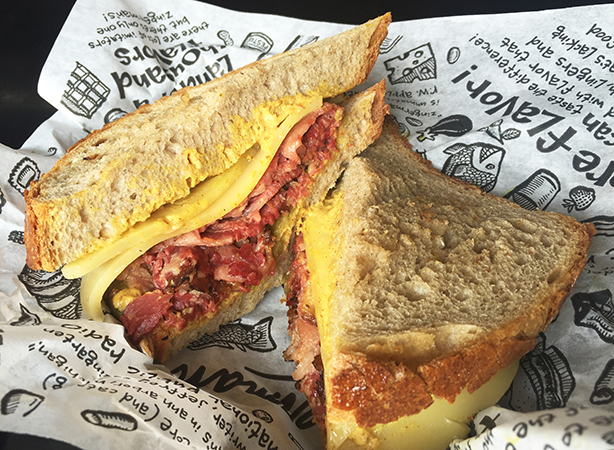 New and Improved Zingerman’s Deli Menu Items!